TAP League offers players of all ages the opportunity to compete on Monday nights. This is a regular division, but is played at Mickey's Cues & Brews. Since TAP League has no minimum age, they simply compete side by side with others in the league. Our state-of-the art handicap system allows everyone to compete equally and track their progress. We have had and still have quite a few families that compete together as a team. 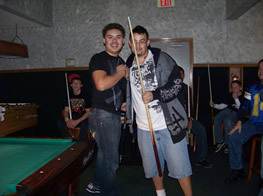 We offer monthly Pool School for all in conjunction with a Scotch Doubles tournament. The day starts with pool school, where players of all ages can learn from some of our local experts. The fun does not stop there. Juniors can bring a partner or be paired with a partner to then compete in our very interactive Scotch Doubles format. Continuous talking and coaching is allowed to continue the learning experience. We have TAP history to share with you. Scrolling down, see the results of our years of working with the youth of Vegas. In 2013, DJ Weishar won 1st place in the newly formed skill level 2 singles tournament at Nationals in St. Charles, IL. He was joined by his parents who were a part of a team who had won a place at Nationals! 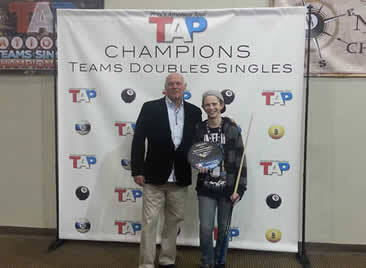 He is pictured here with Loyd Schonter (TAP League founder and CEO) after his victory. 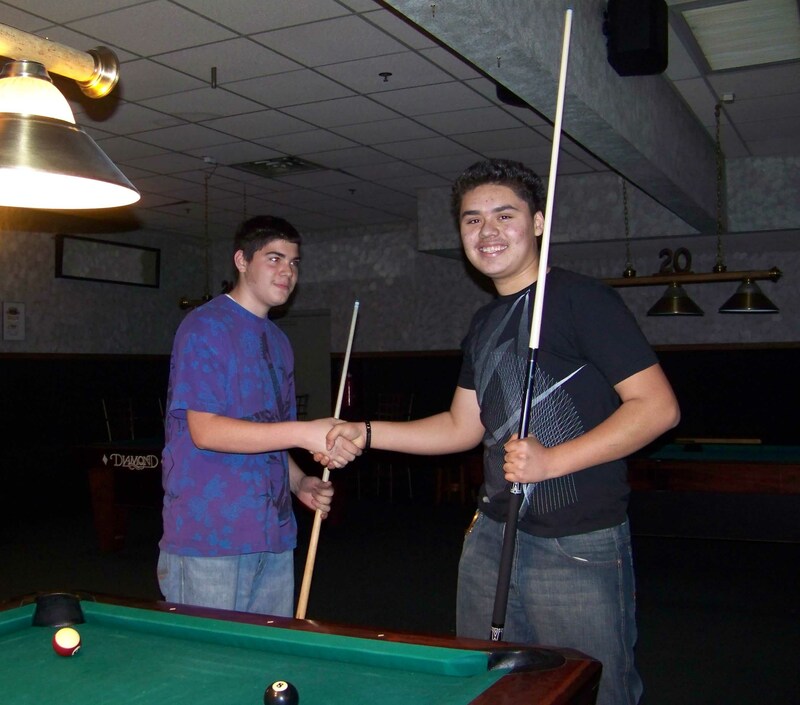 In 2010, one of our own players, Luis Ocampo (pictured on the left) won the Nationals 8-ball competition for the 2/3 skill level. Luis was just 17 years old. He started playing at Chaparral High School in the Billiards Club, then in the monthly TAP Las Vegas Junior Tournaments and league play on Mondays. He took lessons from some of the better players in our league and it paid off! 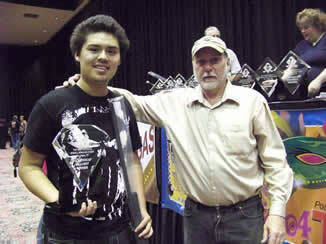 In 2011, the Las Vegas Cue Club sponsored Nick Wortham at the TAP League Nationals. Nick competed with the Renegades on Monday nights. He won his sponsorship by winning first place in a TAP tournament for skill levels 2/3. Nick is the youngest player to have ever won a local TAP tournament. Click here to read his story. So you see, not only can the kids compete during regular weekly league, they can and do advance to Nationals! All ages are welcome to join and compete in TAP. We've secured Mondays at Mickey's to provide that opportunity. For years in the past, we held monthly junior tournaments with Robert LaPlante from Chapparel High School. Our junior players gathered each month to compete in their own tournament and received over 100% of their registration fees back in the form of cues and accessories. We provided instruction, competition and a safe gathering place for the kids to be on these Saturdays. The tournaments were open to any and all players, ages 20 and under. Robert LaPlante is now retired, but ran the Chaparral Billiards Club, a before and after school program promoting education for the kids. In order to be a part of the club, the kids cannot have D's or F's. The club was run by Mr. & Mrs. Robert LaPlante, who worked as a team, donating their time to give the kids something safe and fun to do before and after school. The club had 2 very old 9' Diamond pool tables. They had over 25 dedicated players (students) in the club. All were on track to graduate! Most of the results and photos are posted on Facebook, however, you'll also find results below from some of the earlier tournaments. January 2012 - 1st Place: Michael E., 2nd Place: Mike F., 3rd Place: Josh. February 2012 - 1st Place: Kacie, 2nd Place: Francis, 3rd Place: Alex, 4th Place: DJ. March 2012 - 1st Place: Nick W., 2nd Place: Aaron, 3rd Place: Vince, 4th Place: Michael E.
Congratulations to Aaron for winning the November Junior 8-Ball Tournament held at Mickey's. Congratulations also to Mike for winning 2nd Place, Richie for 3rd place and Ricky for 4th place. The kids bid adieu to Ricky as he turns 21 this month, thus, will no longer be eligible to play. He will continue playing in the Mickey's/Cue Club Diamond Division on Mondays. He has been competing in the tournaments and in league for 3 years! A special thanks to Randy Kukla for giving all of the kids free lessons. He spent the entire afternoon with us. The kids learned a lot and had fun. Johnny was especially excited to beat Randy in a 9-ball game. Mike learned a good lesson in how to bank. Most all of the kids would walk away from their lesson saying, "wow!" 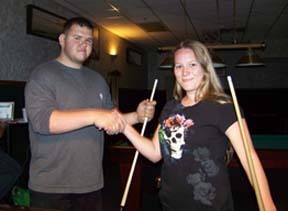 Congratulations to Sean for placing 1st in the Junior 8-Ball Tournament in June 2011 at Mickey's. 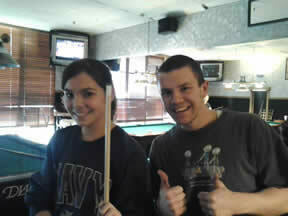 Sean won a pool cue of his choice and a subscription to Pool & Billiard Magazine. Congratulations to Jessica for placing 2nd and winning a cue and to her brother Johnny for placing 3rd and lastly to Sean's sister, Sara for winning the raffle cue. 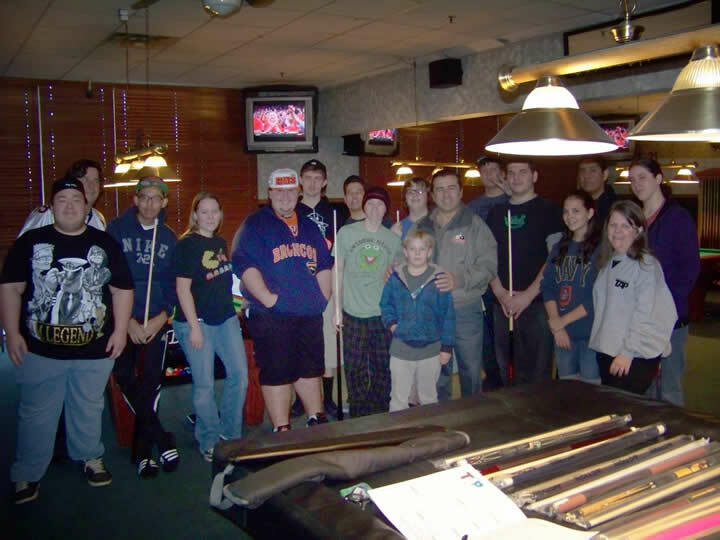 Each month, these kids come together for a little friendly competition, to learn the fundamentals of pool and good sportsmanship and the chance to win cues and accessories. 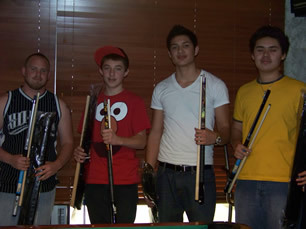 Congratulations Alick, Sean & Joe placing 1st, 2nd and 3rd in the Junior 9-Ball Tournament on Saturday, April 9. Congrats also to Kacie for winning the raffle. Alick and Kacie are now proud owners of their very own cues! Alick will also receive a one year subscription to Pool & Billiard Magazine. Click here to see the pics & a video of Alick winning! Francis "Buddy" Moore wins the March Junior 8-Ball Tournament walking away with a pool cue & case and a 1-year subscription to Pool & Billiard Magazine! Mike Foulke won the mini 9-ball tourney and $25.00! Jessica Page won the cue raffle! A special thanks to Robert Laplante and Mark Mahon for running the tournament, to Mark Hultberg... for the photos, to Harold Simonsen for his donation subscription to Pool & Billiard Magazine and the staff at Mickey's Cues & Brews for their hospitality. Jessica Page wins the Junior Tourney! 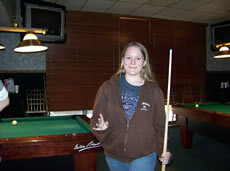 Congratulations to Jessica Page for winning 1st place in the Junior 9-Ball Tournament for February 2011. Congratulations also to Nick Nowlan for winning 2nd place and to Aaron Georgopul for winning the raffle. 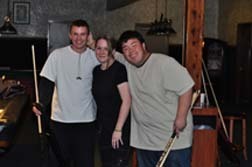 Jessica and Aaron each received a pool cue and Nick received an 8-Ball Muncher TAP t-shirt. Jessica also won a one-year subscription from Pool & Billiard Magazine. 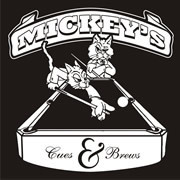 A special thanks to Steve at Mickey's Cues & Brews for his hospitality and to Harold & Carol Simonsen of Pool & Billiard Magazine for their contribution! Click here to see all the pics. Click here to learn more about this monthly tournament. This is a non-profit endeavor for TAP Las Vegas. A minimum of two cues and a subscription to Pool & Billiard Magazine are guaranteed to be awarded every month! Congratulations to Nick Nowlan for winning 1st place in our Monthly Junior 8-Ball Tournament and winning a pool cue and a 1 year subscription to Pool & Billiard Magazine. Congratulations also to Joe for winning 2nd place and Ricky Langston for winning 3rd place. Joe received a cue case donated by Fred Keller. My apologies to Joe for not getting his last name. We were a little informal yesterday and this was only Joe’s 2nd time competing. We've begun a series of monthly 8-ball and 9-ball tournaments for the youth of Las Vegas. 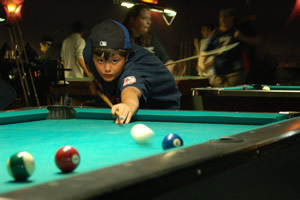 These tournaments give the kids something fun and inexpensive to do and promotes our favorite sport...billiards. This past Saturday was no exception! 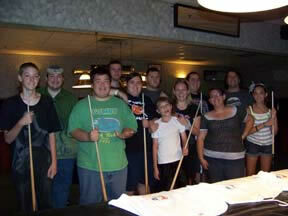 We enjoyed a fun day playing pool, eating great barbecue and socializing. This month, our featured tournament was 9-ball and we added a bonus 8-ball tournament for our enthusiastic group! Congratulations to Luis O. for placing 1st in both the 8-ball and 9-ball tournaments in February and winning 2 cues and a one year subscription to Pool & Billiard Magazine! Congratulations also goes to John V. in 2nd place winning a cue, Ricky L. in 3rd place and Noe A. in 4th place winning 8-ball muncher TAP t-shirts and 1 hour of free pool at Mickey's, William A. and Vince F. in 5th & 6th winning t-shirts. As a bonus, we added a rack race, double elimination 8-ball tournament. Congratulations also goes to Vince F. in 2nd place and Macean in 3rd place. A special thanks goes to all of the parents and kids who attended and helped run the tournament, the staff and owners of Mickey's Cues & Brews, Robert LaPlant for his exceptional efforts in bringing a great number of the kids to the tournament and help running the tourney, Harold Simonsen of Pool & Billiard Magazine for his donation of a 1 year subscription to the winner and Henry Tyler for the great barbecue. The food was exceptional! The Junior 8-Ball Tournament held this past Saturday, January 30, 2010 at Mickey's Cues & Brews was a blast! 31 kids competed for prizes worth over $400!! Congratulations goes to Noe A. for earning 1st place, Nick N. for earning 2nd place, Luis O. for earning 3rd place, John L. for earning 4th place. 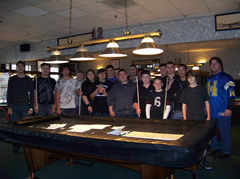 All of these kids won... a cue and case. Congratulations also goes to Joel B. and Vince F. for earning 5th and 6th; Nick P. and Evelyn S. for earning 7th and 8th. 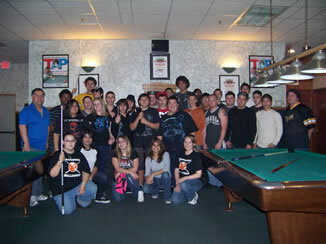 All of these kids won a TAP Las Vegas league billiard t-shirt and an hour of free pool at Mickey's. A very special thanks to Robert LaPlante, Mark Lerma, Mark and Jonelle Mahon for donating and helping with the tournament. Click here to see all of the pics. Pictured below is our first group of young players from 2010: Michael Erle, Nick Nowlan, John Leafdale, Nick Vece and Ricky Langston. They started the ball rolling. Click here for their story. 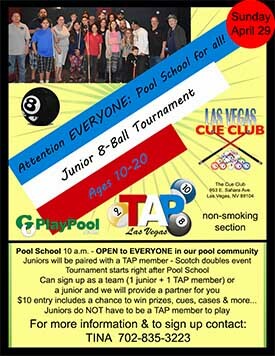 For a listing of other local tournament opportunities, visit the Vegas Billiards Buzz at www.vegasbilliardsbuzz.com.